WASHINGTON — Most people on Earth don’t know what -220 degrees Fahrenheit feels like. The lowest temperature ever recorded on the planet was in 1983 at the Soviet Vostok Station in Antarctica: It was −128.6 degrees Fahrenheit. But these days, more Americans are getting a taste of this incomprehensibly cold climate — if only for three minutes at a time. At Thrive CryoStudio in Rockville, Maryland, owner Brandon Yu presses a button on the side of a 6-foot tall cylindrical chamber. A tank of liquid nitrogen fires up, and a gas-like substance begins circling throughout the enclosure. “It’s vaporized liquid nitrogen,” explained Yu, who was precooling the chamber to -130 degrees Fahrenheit. Yu is one of several business owners in the D.C. area to recently open a cryotherapy studio. Despite originating in the 1970s in Japan, cryotherapy is still somewhat new in the U.S., albeit growing, thanks to celebrity endorsements and affirmations from professional athletes. “What that does is it helps your body recover and heal itself faster, more so than an ice bath, for example,” Yu added. Promises of a quick recovery is one reason why athletes have taken to the trend. But Yu says his clients extend beyond those who work out regularly. “Everyday people” in search of drug-free treatments for back pain, arthritis and anxiety make up the bulk of his business. Cryotherapy has also been promoted as a weight loss tool, since the body works harder to heat itself when exposed to cold temperatures and thus, burns more calories. This, of course, has piqued the interest of those desperate for a quick fitness fix, but Yu is cautious with the claim. “I will never say, ‘Just come in and do cryotherapy just for weight loss.’ Weight loss has many components, and diet and exercise are two of the most important,” he said. One would think — at least hope — that before stepping into an extremely cold, coffin-like case, warm layers and a fur coat would be part of the experience. That is not how it works in cryotherapy. 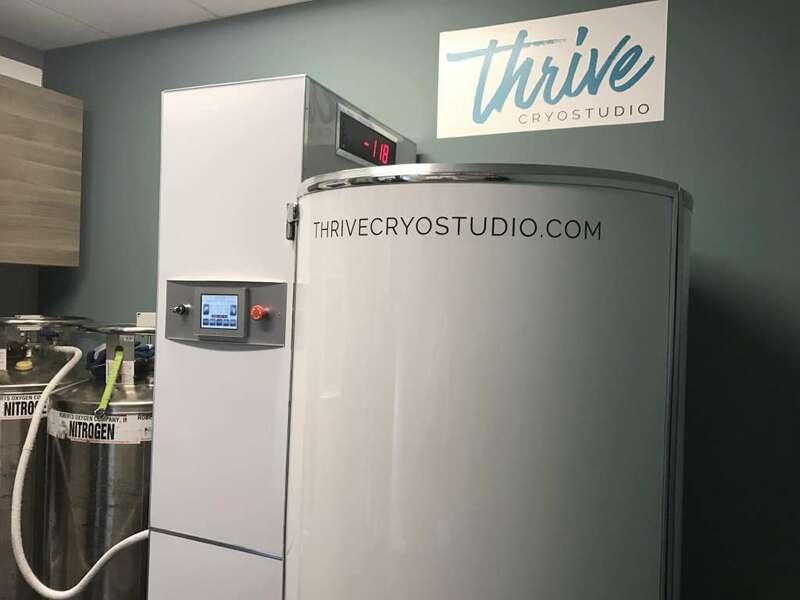 Clients at Thrive CryoStudio wear only a pair of gloves, a set of slippers and their undergarments in a chamber that starts at -130 and dips to -220 degrees. “Most people come out of there saying, ‘It’s not as bad as I thought it would be,’” Yu said, crediting the dry vapor from the liquid nitrogen to its tolerability. Clients also say they leave with a boost of energy, Yu added. While some praise cryotherapy, others are leery of its benefits. The U.S. Food and Drug Administration makes it clear on its website that it has not approved whole body cryotherapy devices as safe and effective to treat medical conditions, despite ongoing marketing around those claims. Scientific studies, for the most part, are inconclusive on its benefits. There are risks involved, too. Yu explains the body must be free of moisture, such as sweat or oils, before entering the cryotherapy chamber, otherwise the skin could freeze and frostbite could occur. Asphyxiation is another potential hazard, according to the FDA. “The addition of nitrogen vapors to a closed room lowers the amount of oxygen in the room and can result in hypoxia, or oxygen deficiency, which could lead the user to lose consciousness,” the agency’s website says. However, fans of cryotherapy see past the risks. Joanna Fryben, owner of Manhattan’s KryoLife, told The New York Times she had plans to expand her midtown practice to seven centers, including a mobile “cryotruck,” to meet the demand she sees from customers. Yu is opening a second location in Annapolis, Maryland, next month, and another in Bethesda shortly after. “Our goal is to be the Starbucks of cryotherapy; we want it to be as convenient as possible,” said Yu, who charges around $30 per session. DistrictCryo moved into D.C.’s Shaw neighborhood in 2016, and Capital Cryo opened near American University in early 2017. Additional studios and spas are scattered throughout Northern Virginia.